I first learned to weave when I was 10, fascinated by the play of light on crossed threads. My experimental school let me set up a loom and weave a rainbow of color, pattern and texture. Every textile, from simple structures to complex weaves, carries a kind of coded relationship between time and space. It’s a language of tactile memory connected by hidden structure, and deeply embedded in human experience. Since that first weaving, textiles have been my lifelong journey. They have taken me on trips through landscapes, cultures, history and imagination provoking my endless curiosity. Areas of research include visual culture, textile technology, design history, art history, fashion history, and sustainable design. Especially interested in projects where these topics converge. Surface Design student work inspired by the textile collection and database of Textile Hive, in conjunction with Portland Design Week. Co-curated with Caleb Sayan. Original WPA art and crafts from the lodge on Mt. Hood: ironwork, furniture, weaving, prints. Co-curated with Linny Adamson. Tea as cultural expression representing India, China, England, South Africa, Japan, Argentina, and Morocco. Weekly public events with tea experts showing traditions from around the world. Co-curated with Meredith Hamm and Eric Wynkoop. 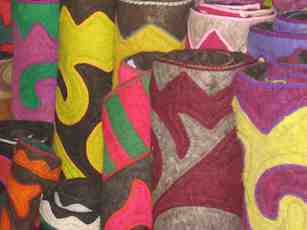 Felted wool designs by Tash Wesp, myself, and Kyrgyz craftswomen. Inspired by my 2010 sabbatical research in Central Asia. Selections from the extensive archives of this international brand begun in Portland, including advertising art, and swimwear. Documentary video produced for the opening. Co-curated with Jantzen Archivist Carol Alhadeff. Sustainable Fashion, The Art Institute of Portland Gallery, 2008. Invitational exhibit of 9 innovative Northwest designers. Auxiliary juried student design competition. Comprehensive survey of contemporary art embroidery. Co-curated with Namita Gupta Wiggers and Manya Shapiro. “Timberline Textiles,” Portland Handweaver’s Guild, Portland, OR, 2019. “Timberline Lodge Textiles: Creating a Sense of Place,” Textile Society Society of America Symposium, Vancouver, BC, 2018. “Timberline Textiles: Creating a Sense of Place,” Textile Society of America symposium proceedings, 2019 anticipated. "Book Review: Stitching the World: Embroidered Maps and Women's Geographical Education," Journal of Textile History, Vol 47, Issue 2, Taylor & Francis online, Sept. 13, 2016. "Meisen Magic: How Textiles Could Revolutionize Big Data (Again)," Medium online magazine, June 1, 2015. “Exhibition Review: Io Palmer: Artstars,” Textile: The Journal of Cloth and Culture, vol. 9, issue 3, Berg Publishers, 2011, pp. 384-386. "Reinventing Velvet,” Fiberarts, Interweave Press, Sep./Oct. 2009, pp. 50-53. “Exhibition Review: Darrel Morris: The Large Works 1999-2008,” Textile: The Journal of Cloth and Culture, vol. 7, issue 3, Berg Publishers, 2009, pp. 338-343. “A Stitch in Time: New Embroidery, Old Fabric, Changing Values,” Textiles as Cultural Expressions, Textile Society of America symposium proceedings, 2009. “Policarpio Valencia’s Embroidered Poetry,” Approaching Textiles, Varying Viewpoints, Textile Society of America symposium proceedings, 2001, pg. 153-156.